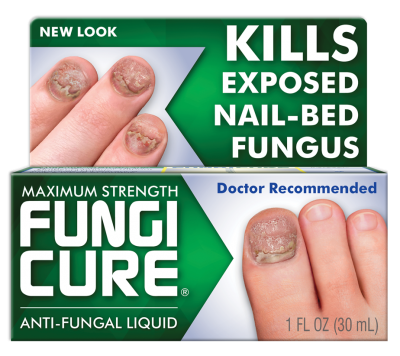 Each FUNGICURE anti-fungal product is formulated to cure unsightly and uncomfortable fungal infections. 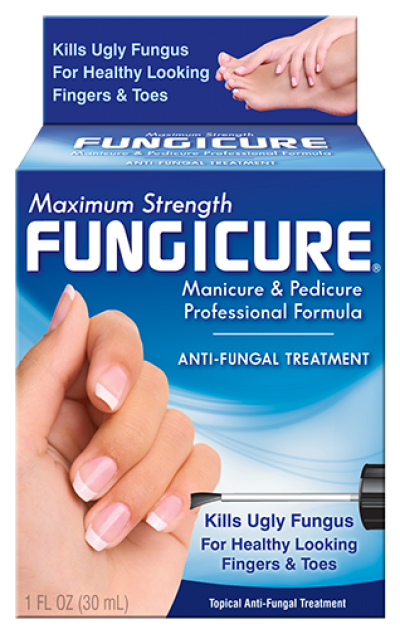 FUNGICURE helps eliminate fungal infections of the finger and toe areas which, if left untreated, can migrate to healthy skin and nails. 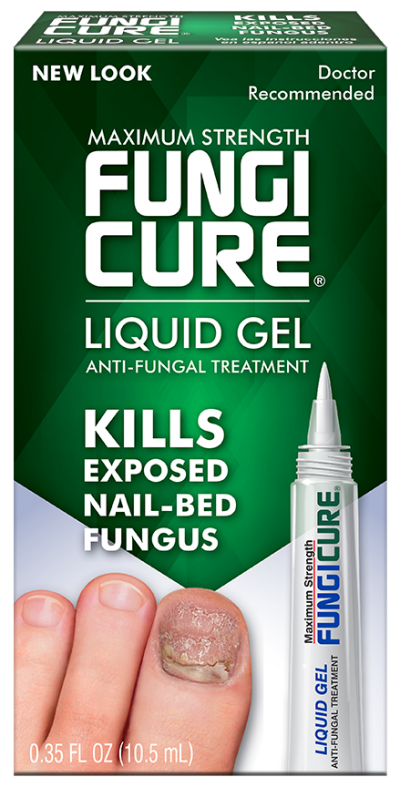 Recognized to be safe and effective by an FDA Expert Advisory Panel when used as directed, the active ingredients in FUNGICURE finger and toe products quickly target and destroy fungus at the site of infection and prevent it from spreading. 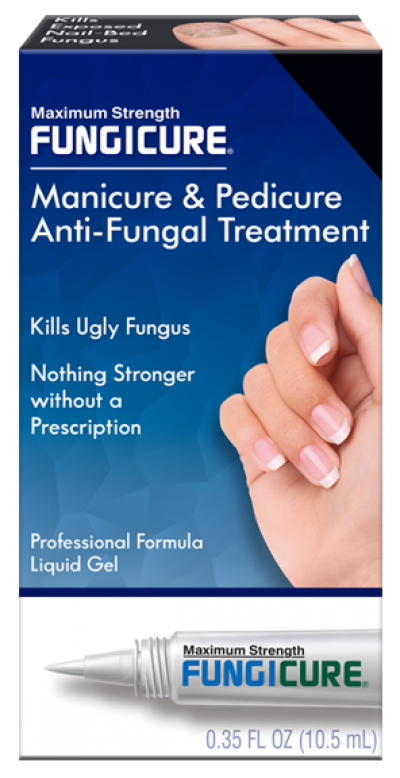 Each FUNGICURE anti-fungal product contains maximum strength active ingredients such as undecylenic acid and clotrimazole to eliminate fungus and allow for the natural re-growth of healthy tissue. 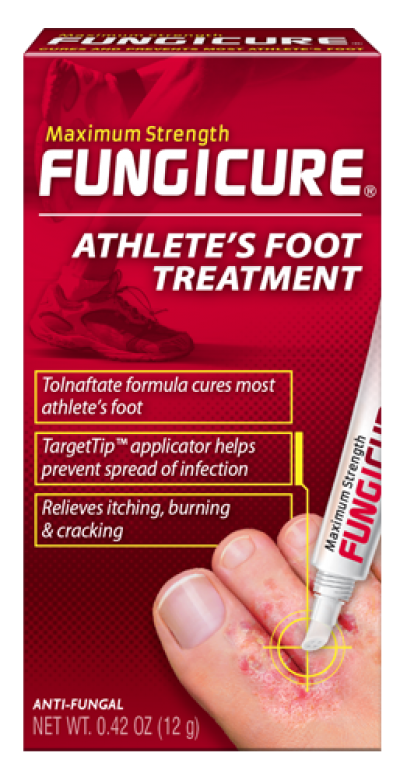 FUNGICURE also cures most athlete’s foot (tinea pedis) and ringworm (tinea corporis) and helps stop the spread of such fungal infections. 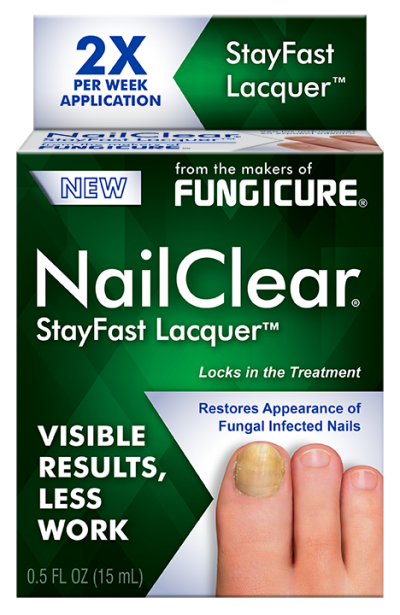 Fungus can infect the entire nail area of fingers and toes. This includes the surrounding skin, the nail beds and the nails surfaces themselves, commonly referred to as the nail plates. While an intact nail plate, being a hard surface, is not penetrable by over-the-counter topical applications, in some instances, the nail plates are cracked open, breached or partially separated from the nail bed. In other instances, fungal infections reside on skin around and adjacent to the nail plate, on the cuticles, and under the exposed quick of the nail. In these instances where the fungus is exposed, Maximum Strength FUNGICURE, with its powerful anti-fungal action, applied as directed, may be able to reach the site of the infection, eliminating the fungus and allowing for re-growth of healthy tissue. 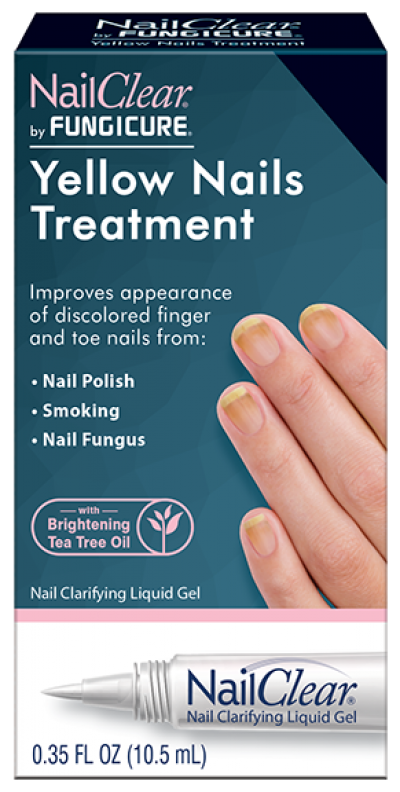 Fungal infections that are isolated beneath an intact nail plate or embedded within the nail plate itself may require consultation from a Doctor or Pharmacist for proper treatment. HOW DO YOU KNOW IF YOU HAVE A NAIL AREA FUNGUS INFECTION? Finger and toe area fungus infections are often characterized by scaling of skin, burning, cracking, itching and related discomforts. When nails become infected, they may appear to become opaque (cloudy white), thickened, brittle, friable (easily broken) and in some cases, discolored (greenish/brown). HOW TO AVOID RECURRENCE OF FINGER AND TOE AREA FUNGUS INFECTIONS? Since fungus enjoys and thrives on moisture, keep hands and feet meticulously clean and dry. Good personal hygiene is your first line of defense against recurring fungus infections. In cases where athlete's foot (tinea pedis) has been a problem, wear well-ventilated shoes and wear clean socks daily. Avoid any practices that can tear or bruise the skin. Avoid trimming cuticles back too far and avoid cutting nails too close. Anything that tears or opens the skin invites fungus to invade. WHAT CAUSES FUNGUS INFECTIONS OF THE FINGER AND TOE AREAS? Common topical fungus infections of the finger and toes are caused by a variety of fungi; actual living organisms (members of the yeast and mold family) which thrive in dark, moist conditions. Using small breaches in the skin’s surface, these organisms can cause infection by contact with infected surfaces, animals, or people. Once infection starts, spreading may occur. For example, infected fingers and toes may infect other fingers and toes. Although such infections often develop slowly, they may be difficult to eliminate if not treated promptly with an effective anti-fungal medicine like FUNGICURE. There are a number of specific types of fungi, each of which can affect body tissue and proceed to grow. Common topical fungi infectives generally fall into three categories: microsporum (hair and skin), epidermophyton (skin and nails), and trichophyton (hair, skin, and nails). Among the more common fungi is E. floccosum, which can cause ringworm infection on the body, hands and feet, on and between the fingers and toes including the skin around the nails. Other common fungi are T. rubrum and T. mentagrophytes, which can cause athlete's foot and infect the feet, on and between the toes including the skin around the toenails. Often such infections develop slowly and may be difficult to treat if not attended to promptly with an effective anti-fungal medicine like FUNGICURE. Fungal skin infections are caused by yeasts or molds (fungi) that usually make their homes in moist areas of the body where skin surfaces meet: between the toes, in the genital area, and under the breasts. Common infections such as athlete’s foot, jock itch and ringworm are caused by those fungi and are easy to get and pass around. Fungal infections are typically classified by their location on the body, e.g. groin (jock itch), feet (athlete’s foot), body (body ringworm, tinea versicolor), and scalp (scalp ringworm). Doctors may suspect a fungal infection when they see a red, irritated, or scaly rash in one of the commonly affected areas. HOW DO YOU KNOW IF YOU HAVE A FUNGAL SKIN INFECTION? Itching, chafing, burning, or skin redness. Some fungal skin infections may present themselves as ring-like formations with clear centers, commonly referred to as ringworm. Athlete’s foot is often characterized by scaling of the skin, burning, cracking, itching, and related discomforts. The main symptom of tinea versicolor is patches of discolored skin on the upper body that have sharp borders and fine scales, are often dark red to tan in color and do not darken in the sun so they may appear lighter than the surrounding healthy skin. WHAT ARE THE CAUSES OF JOCK ITCH AND OTHER FUNGAL SKIN INFECTIONS? Sharing clothes or towels with others who have a fungus infection. Good personal hygiene is your first line of defense against recurring fungal infections. Shower or bathe daily, as well as after physical activity that may cause sweating. Wear clean clothing and change clothing daily, especially undergarments that are in contact with affected areas. If you have a fungal infection on another area of your body, such as athlete’s foot or finger-and toe-area fungus, be sure to treat it right away to help prevent the fungus from spreading to the groin or torso. Regular use of Medicated FUNGICURE Anti-Fungal Wash helps eliminate/wash away fungus and bacteria that can attack healthy skin. Check out the latest videos from FUNGICURE.